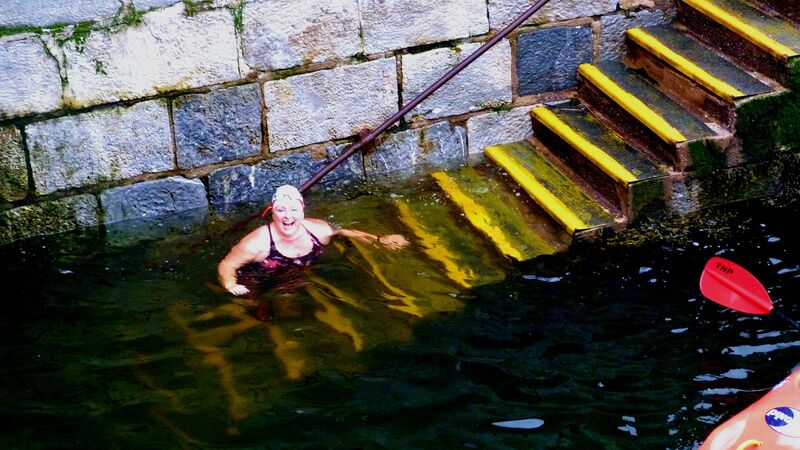 Vaulting the Bridges: The Story of Janet Dillon’s Lee Swim! 500 swimmers lined up in Cork this year for the annual Lee swim, and we all giggled and laughed and shivered afterwards as we swapped stories about the race, the weather, the tactics and the swim itself. But what about the supporters, friends and loved ones on the bridges and lining the route in the rain. 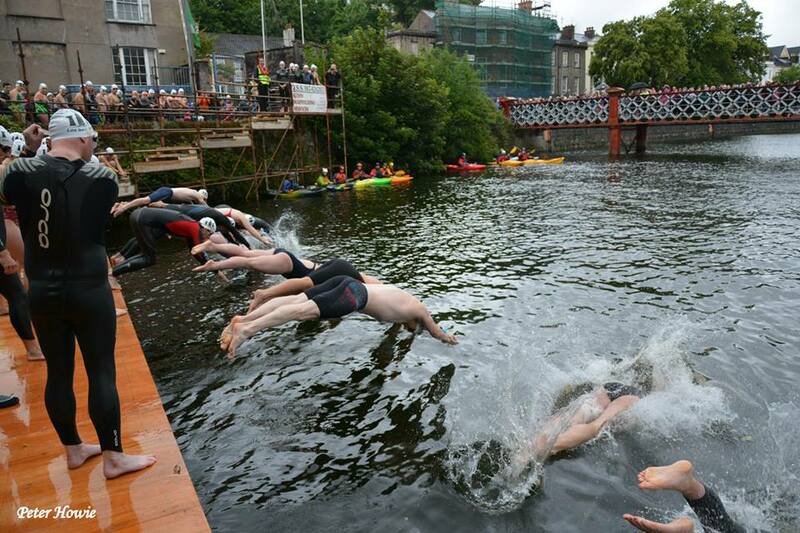 My mate Janet Dillon from Cork City Ballet had a Lee Race too, but she didn’t get a toe wet. 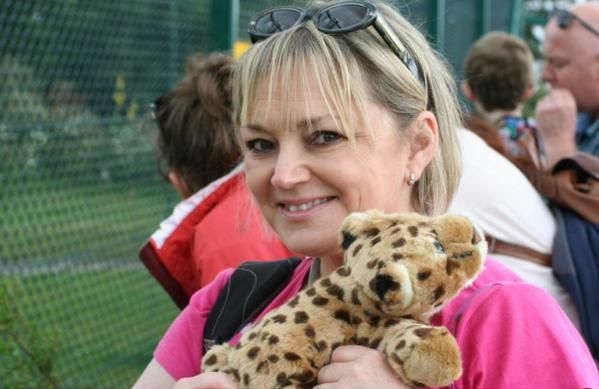 Here is HER Lee Story…. “Get me a Rennie, I’m nervous” came the appeal. “Sure, need anything else?” I replied. Thus began the morning of Saturday, 11th July. 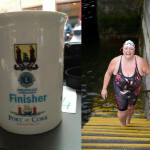 Teena and her swimming pals were hurtling down the railway tracks in the direction of Cork. And that only meant one thing. Her first Lee Swim was looming large and staring her in the face. Let me be abundantly clear. I was NOT actually swimming myself (I’m one of those people who howls obscenities at even getting her ankles wet). I’d taken it upon myself to be The Pal, The Bodyguard (as we’d joked on twitter) and, since I knew the area, I thought I’d try and get her to the start line in one piece! Emerging from the lift into a packed foyer in the Clarion, I marvelled at the crowds of people – normal people, right? – who were actually GOING TO SWIM IN A RIVER. For a moment I wondered what it was I had been doing with my life, but I was quickly jolted back to my senses. Catching Teena’s eye across the melee, her race number emblazoned in indelible ink on her left hand, I could see that her problems now were real: where had she left her bottle of water, and why the HELL did she need two bags?! Even more real was the first of two safety briefings which ensued. “Stay in the centre of the river or you face serious injury”. If Teena was calm, she HAD to be pretending. I, on the other hand, kept stifling gasps of “oh GOD” and at this point, would have forgiven her for kicking me in the shins! A friendly Dub called out “Teena, take a taxi to the start”. Thinking this a splendid idea, and deciding that I owed it to her to not drag her a mile down the road in the rain, we bundled into a taxi with another friendly swimmer-lady who joined us. Teena couldn’t be nervous, could she… perish the thought: she won’t mind hearing about the poor unfortunate that got swept off course in a previous year…..?? And then we were there. We parted in a flurry of “it’s all your fault” and I assured her she would thank me later…. Not knowing quite where to put myself, and secretly wanting to run back and tell her that she could really get her swimming “kick” in the local pool – she could even have a Jacuzzi – I decided to position myself on the bridge opposite, elbow a few people to one side, and stand on my toes and watch the drama unfold. And soon she was there, diving in …. And then she was gone. Gone. I’d lost her. I’d raised my camera to snap, I was momentarily pushed out of the way. And I lost her in a flurry of white swimming hats. Walking briskly up the river’s edge, straining to track her down, I ran across roads without looking, practically vaulting over the bridges and elbowing shoppers out of the way. HOW could people simply be out shopping when my pal was lost in the river??? I knew that she’d be rounding the bend at the Port of Cork sign, an area out of bounds to us landlubbers, so I threw in the towel and resigned myself to the cheap seats at the security barrier. Those burly security men were resolute in their efforts to keep me back. I ducked and dived like a kid at an arrivals gate, and then I heard it. The laughter, the clicking of cameras, and she’d made it up the steps. I swear I almost heard “chariots of fire” as she sashayed over to the fire truck! A flick of her soaking wet hair woke me up, and then it was over. There were no jellyfish harmed in the making of this production; there were no jellybabies (cough, cough, @LeeSwim twitter account), and there were no shoes. They’d been left at the start line, later to be retrieved, but a little barefoot couture and a lot of rain were not going to dampen the exhilaration of this swimmer and her pal. She feathered (yes, I know what that is), she got her elbows high out of the water, and she breathed on both sides. I’m an expert now, but I know one thing: I’m leaving the rivers to Teena. I can’t necessarily say that it’s safer or more fun on the riverbank but the laughter and the celebrations were worth it in spades. Off you go, missus, on to your next river….. and I have a feeling you’ll be back!